If you are reading this, you are most likely considering purchasing a garage door opener for your home. 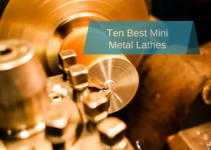 They are useful to have, but it is not so easy to find one of decent quality—especially for an affordable price. The purpose of this article is to review specific garage door openers and provide unbiased insight on them to help you make an informed decision. Each of the products in this review was carefully chosen from some of the most highly rated garage door openers available. You can expect information regarding the features, advantages, and disadvantages of using each of the products listed in this article. Choose one that is fully capable of lifting the weight of your garage door. It is generally better to get a quiet and vibrationless garage door opener. Preferably, you should find one that is easy to install and use. One with a battery backup is ideal, especially if the power goes out. Try to pick one that has the adequate safety features to protect you and your belongings. The SOMMER 1052V000 is said to be quiet, durable, and strong. Various customer reviews claim that this is, in fact, the case. Specialized Direct Drive technology helps simplify the process and reduce overall noise during operation. It is unlike conventional garage door openers, which operate using chains, belts, or screws that can cause quite a bit of unwanted noise. The SOMMER 1052V000 is designed to glide along with near silence across the chain embedded within a firm steel rail. This is undoubtedly a good choice if you are looking for a quiet garage door opener that produces minimal noise and vibration. The operation is smooth with the unique “soft start and stop” technology included with the garage door opener. 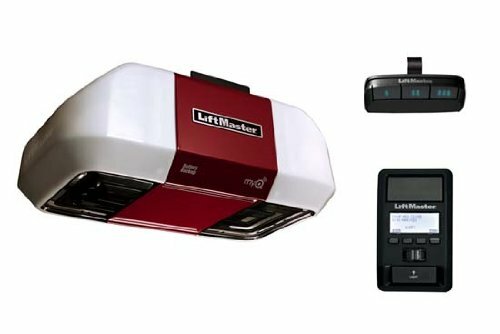 The Liftmaster 8557 is considered fairly durable compared to the majority of other garage door openers. It is fairly close to the SOMMER 1052V000 in noise reduction, which decreases the risk of disturbing any other residents. MyQ technology gives you the ability to control and monitor the garage door opener with your mobile device or computer. The application is free to download and does not require an annual activation fee. 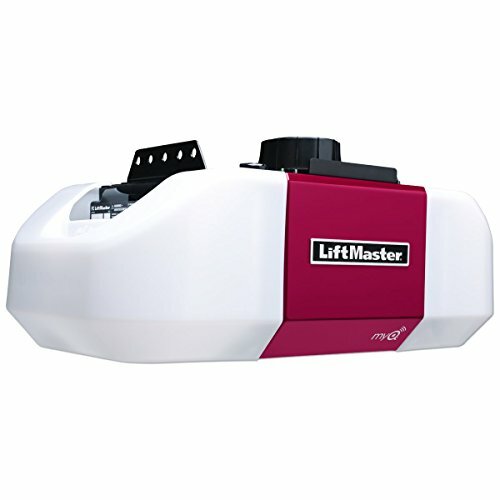 The 3/4-horsepower motor included with the Liftmaster 8557 uses a combination of a powerful pulling force with a firm steel belt. This enables it to lift heavily reinforced doors with ease. Combined with the ultra-quiet belt-drive system, makes it ideal if your home has any living areas next to the garage. The PsiLock system integrated into the Liftmaster 8557 locks down your door if a forced opening is attempted, reducing the likelihood of anyone breaking in. A specialized timer remembers to lower and close your garage door if you forget to. The timer sets off if the door is open for more than a number of minutes chosen by you. To ensure security during this process, audio and visual warnings alert you when the garage door is about to close. 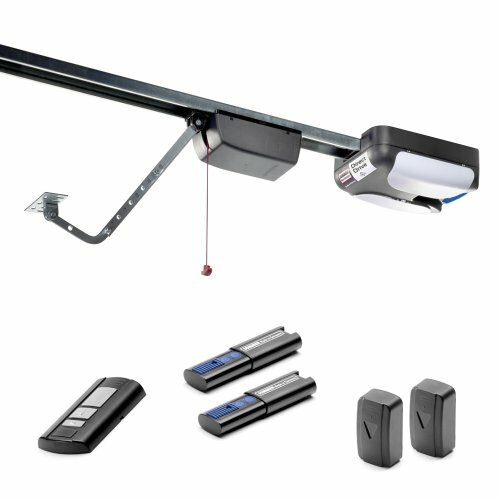 The manufacturers are confident in the durability of this garage door opener, providing you with a lifetime motor and belt warranty. As well as a 5-year parts warranty. 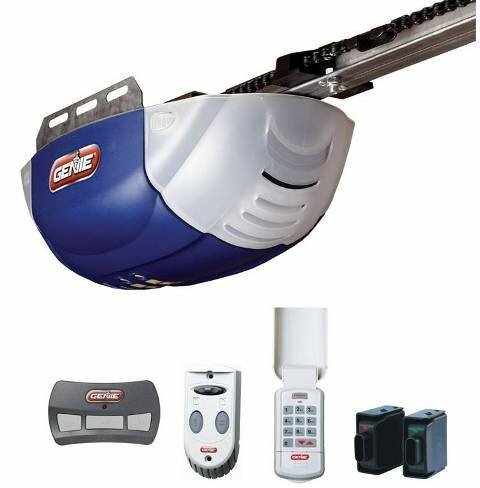 Another garage door opener that is considered fairly quiet is the Genie QuietLift 800. Reviewers are generally satisfied with their purchase of this garage door opener, and say that it works exactly as stated by the manufacturer. It is considered easy to install, but it is recommended that at least two people perform the installation. Afterward, you can expect powerful, reliable performance from the QuietLift 800. Of course, it opens and closes near silently, as to not disturb anyone nearby. Although, it is slower than most other garage door openers. 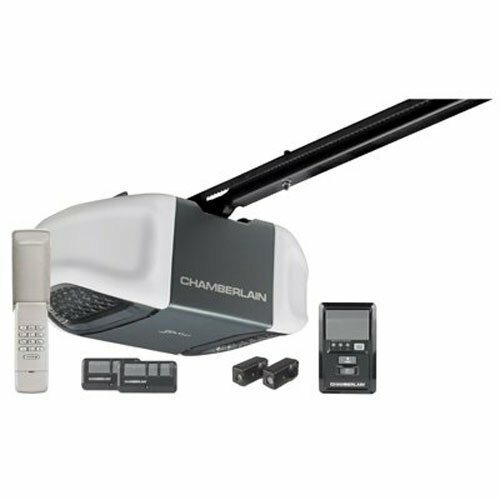 The Chamberlain Whisper Drive is designed to provide its functionality even if the power goes out. It utilizes a battery backup that allows you to access your garage whether or not you currently have power in your home. This means that the garage door opener and its safety features will all function properly during outages. It is also fairly quiet during operation, using an efficient 3/4-horsepower motor to lift the garage door. If left open for too long, it will automatically close on its own, or you can use the optional mobile app to close it remotely. The LiftMaster 8550 gives you the ability to safely monitor and control your garage door with a free smartphone app. 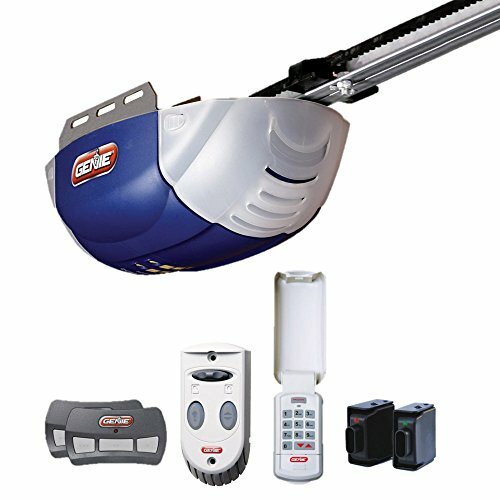 Like the Genie QuietLift 800, the garage door opener functions with or without power. 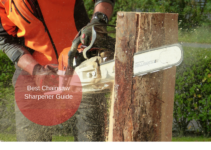 Reviewers regularly comment on the quality and durability of the LiftMaster 8550. Although, some state that it is too expensive, even with this quality. 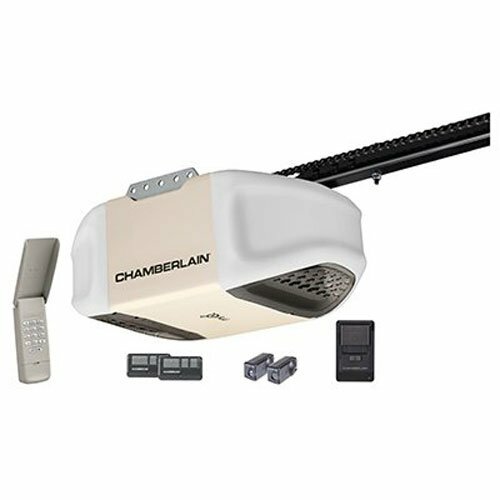 Currently, the Chamberlain WD1000WF is one of the best selling garage door openers available. It features MyQ smartphone control, that allows you to open or close your garage door from miles away. The battery backup included with the garage door opener lets you get in and out during power outages. The heavy-duty reinforced steel belt uses specialized technology to dampen sound during operation. With 1-1/4 total horsepower, it is capable of lifting even the heaviest of garage doors. Even with regular use, the motor can last for multiple years, and sometimes over a decade. 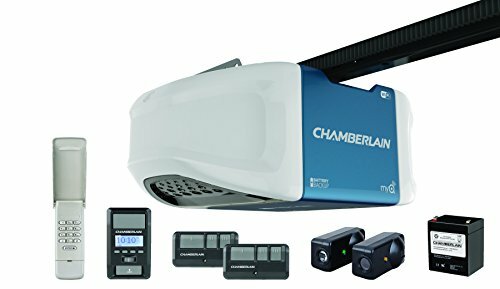 Another excellent garage door opener by Chamberlain is the WD832KEV. The 1/2 horsepower motor is capable of lifting whatever garage door you have while still maintaining near silence. It features an innovative Motor Vibration Isolation System that eliminates vibration and reduces overall noise. For added convenience, the garage door opener has a timer function that automatically closes the garage door if you accidentally left it open. You can also use the MyQ app monitor and control, the garage door from your smartphone. 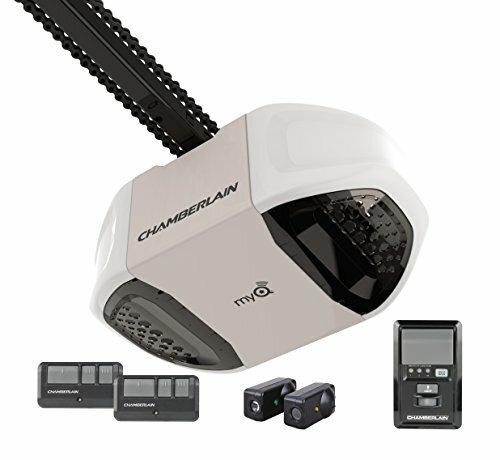 This MyQ-enabled Chamberlain garage door opener comes with a powerful 1/2-horsepower motor that can easily lift heavy doors. Specialized multi-frequency transmitters are used to help eliminate any interference, and provide ideal performance even over a long range. The system is easy to install and fits most garages with seven feet high garage doors. The solid steel chassis and rail are durable, lasting for well over a decade, if not longer. Improved technologies allow you to control the Chamberlain PD762EV from anywhere in the world. This garage door opener features Tri-Band burst radio technology in the remotes, providing better range and performance. Energy-saving systems are used to increase the overall lifespan of the product. The PD762EV is easy to install and works with the MyQ application. Last on the list is the Genie 2022-KFV Chainlift 800, with a powerful 1/2 horsepower motor. 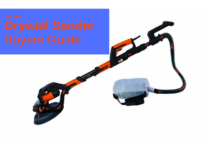 It is considered easy to install, mainly due to its relatively light weight and rather simple instructions. Reviewers were mostly satisfied, and found no major problems with the product, often commenting on how it was quieter than they had previously expected. Although some claim that it is also fairly slow to open, often taking up to ten seconds to raise or lower. These are some of the best garage door openers currently available. They each have their own unique features and functions, as well as positive reviews from those who had purchased them. If you are unsure which you should get, take a look at the tips located near the top of the article.